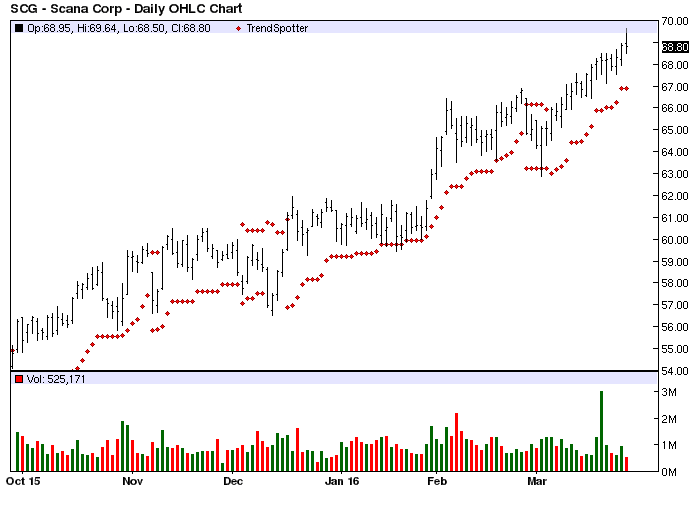 The Chart of the Day belongs to SCANA Corp (SCG). I found the electric utility stock by using Barchart to sort today's All Time High list first by the most frequent number of new highs in the last month then for technical buy signals of 80% or better. I always use the Flipchart feature to review the charts. Since the Trend Spotter signaled a buy on 3/4 the stock gained 4.34%. SCANA Corporation is an energy-based holding company whose businesses include regulated electric and natural gas utility operations, telecommunications and other non-regulated energy-related businesses. SCANA's subsidiaries serve electric customers in South Carolina, North Carolina and Georgia.